Me? I like a good arch. 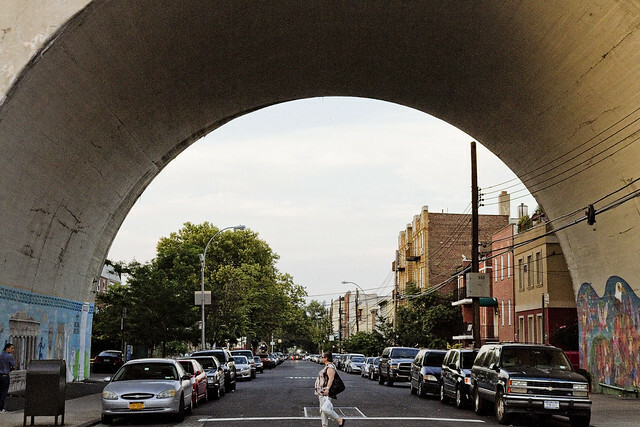 In glorious Astoria, Queens, you’ll notice that the neighborhood hosts a rail viaduct which carries the New York Connecting Railroad tracks to the Hell Gate Bridge, and that the cyclopean concrete structure uses a series of arches to carry the load. Whenever I’m out shooting, a point is made to photograph arches whenever they’re encountered, strictly in the name of “framing” for the composition. These tracks have been here since 1917, and opened in March, or possibly July of that year. The arch is actually a relatively modern “thing” as far as human history goes, and began turning up in the built environment roughly 4,000 years ago in Mesopotamia. The Romans are famous for their usage of the arch and created several twists on the structural element. They would line up a series of arches to create an arcade, or twist them around a focal point to build domes. 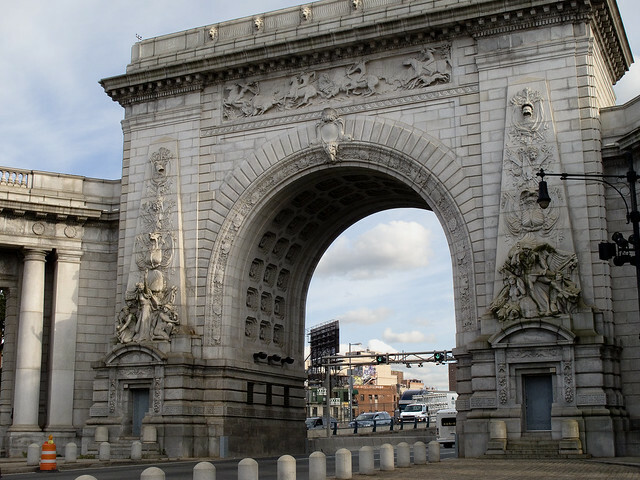 They also came up with the idea for triumphal arches, like the one you’ll find on the Canal Street side of the Manhattan Bridge, which also has a colonnade. In case you were wondering – the Manhattan Bridge arch and colonnade were opened for inspection some five years after the bridge itself premiered. It was in 1910, a year after the bridge opened, that the architectural firm Carrère and Hastings drew the plans for the arch, and it was sculpted by Carl A. Heber. There’s also a sculptural frieze called “Buffalo Hunt” by a fellow named Charles Rumsey. 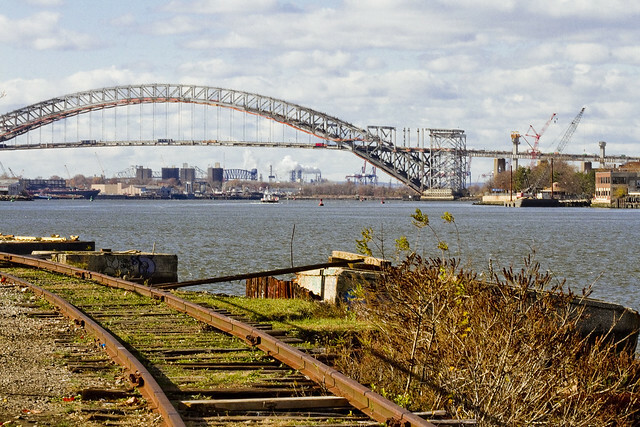 Speaking of arches and the New York Connecting Railroad, as well as Astoria, you’d be remiss not mention the treasure of treasures which is Hell Gate. Lindenthal and Horbostel designed the great rail bridge, which is actually a series of bridges when you get down to it. The main attraction is an inverted bow spring arch. Technically speaking, it’s called the East River Arch Bridge. 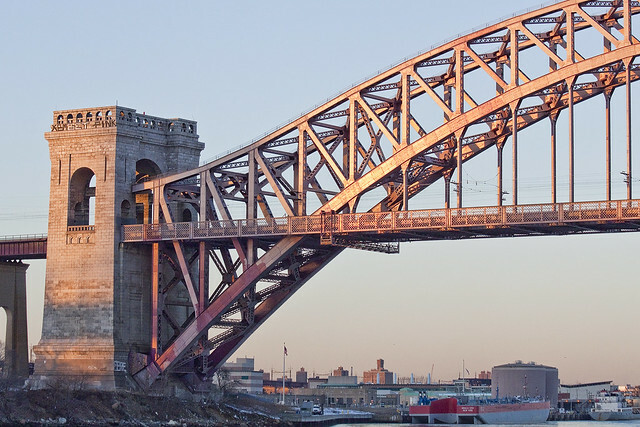 The New York Connecting Railroad Bridge, aka the East River Arch Bridge- or commonly the Hell Gate Bridge- is estimated to be the most permanent of all the structures garlanding NY Harbor. According to Discover Magazine’s Feburary 2005 issue – it would take a millennium of environmental decay for Hell Gate’s steel to fail and collapse as compared to a mere 300 years for the other East River crossings. A target of no small strategic importance, Hell Gate was a mission objective for the Nazi saboteurs who were landed in Amagansett, Long Island by a Submarine (U-Boat 202– the Innsbruck) during the second World War’s Operation Pastorius. The legal consequences of Pastorius, by the way, are the precedent setting United States Supreme Court decision of Ex Parte Quinn. Ex Parte Quinn is the legal pretext that underpins the detention of and trial, by military tribunals, of “foreign combatants” in the United States – a central tenet of our modern Terror War. My favorite arches can be found at my favorite place, of course. 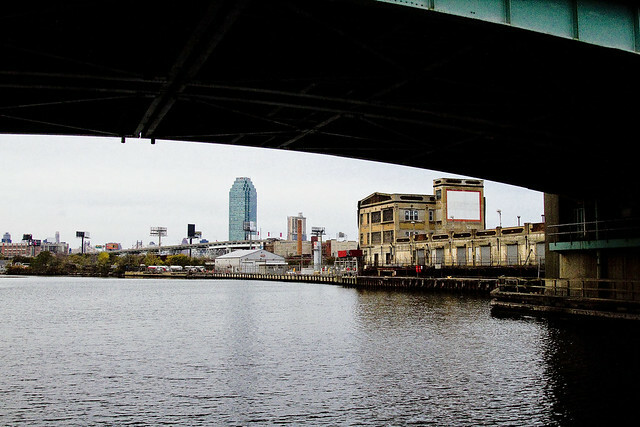 The Greenpoint Avenue Bridge over Newtown Creek is featured above. There have been multiple bridges erected at this location over the years, but the first one was known as the “Blissville Bridge” and it was erected in 1850. The Greenpoint Avenue Bridge is a double-leaf trunnion bascule, with 21.3m wide leaves. This bridge is a steel girder structure with a filled grid deck. The bridge provides a channel with a horizontal clearance of 45.4m and in the closed position a vertical clearance of 7.9m at MHW and 9.4m at MLW. The bridge structure carries a four-lane two-way vehicular roadway with a 1.2m striped median and sidewalks on either side. The roadway width is 8.6m and the sidewalks are 4.0m and 3.7m for the north and south sidewalk respectively. The approach roadways are narrower than the bridge roadway. The west approach and east approach roadways are 17.1m (including 1.4m center median) and 11.9m respectively. Greenpoint Avenue Bridge is also known as the J.J. Byrne memorial bridge. Who was Byrne? Long story, click here to learn more. Over in Staten Island, the Bayonne Bridge opened for use to the general public was 28,856 days ago, on November 15th, 1931 at 5 A.M. Bayonne is the fourth longest steel arch bridge upon the entire planet, and was designed by Othmar Amman. Click here for more on the Bayonne Bridge, and the construction project underway which is raising its roadway to accommodate a new class of cargo vessel.